A string of gun-related incidents at Berkeley High has prompted community concern for the safety of students. Berkeley High School parent Joyce Fleming spoke with a deliberate and urgent tone Wednesday night at the Berkeley Unified School District Board of Education meeting. "My blood has been boiling this last week," she said. "I'm scared for my daughter. I'm scared for her friends. I'm scared for her teachers." Fleming's anxieties stem from a recent stint of incidents involving firearms at Berkeley High this year, including one last week when a shot was fired through a bathroom wall on campus. Four guns have been confiscated from students by the Berkeley Police Department since January. Most recently, the high school went on lockdown Wednesday when a parent reported spotting a young man walking the perimeter of campus with a gun in his waistband. No injuries have resulted from any of the incidents, and principal Pasquale Scuderi has praised how the on-site response of security staff and police resolved each situation. School and district officials are now scrambling to organize short- and long-term plans to quell the trend in armed students on campus, hoping to establish realistic policies to better protect the 3,300 students at the high school. "It saddens me that our school culture and school climate has taken the hit that it has," Scuderi said at the meeting. "We're open to getting better. We're committed to getting better." So far, Scuderi has worked closely with Superintendent Bill Huyett and district Director of Student Services Susan Craig to develop strategies to improve campus safety. Actions already taken include adding two safety officers at the high school - upping the total number to 14 - and organizing student focus groups to initiate discussion about the issue. More ideas from the community emerged at Monday's parent forum on gun safety at the high school led by Huyett and Scuderi, who took questions from an audience of more than 100. Some parents stressed the need for immediate action, asking the school to consider installing metal detectors at campus entrances or to enforce an identification badge system for all students. Others said that communication with students is key to enhancing security and that any screening processes might exacerbate discrimination among students. "I wonder how you would implement a search and seizure policy and who exactly would be the ones to implement it," parent and Berkeley High alumnus Scott Blake said at the forum. "Because I would imagine that with our history to this very day how we violate people's rights ... that is going to be a problem." Matthew Golde, head of the juvenile division of the Alameda County District Attorney's Office, also attended the meeting and said some parents do not fully grasp the danger at Berkeley High. He said the police reports that he has read for several arrested Berkeley High students indicate that guns are being used to commit armed robberies both on the campus and in the neighboring park on Allston Way. "Take this really seriously before something bad happens," Golde said. "We're lucky when that bullet went through the wall of that bathroom ... it didn't hit anyone. But it could have." While Huyett said at the meeting that metal detectors would not be considered, he and several board members expressed interest in implementing a mandatory identification badge system. Requiring students to wear badges at all times would ideally prevent individuals who are not Berkeley High students from entering the campus with intent to harm others. Board member Beatriz Leyva-Cutler noted at the meeting that Berkeley High's spring break - beginning Monday - comes at an opportune time. Huyett and the district will use the week to prepare possible action items for the next board meeting on April 13. Until then, parents like Fleming will have to wait to hear what specific changes will be made. "There are a lot of wonderful things about the school, and I am excited for my daughter to be there," Fleming said. 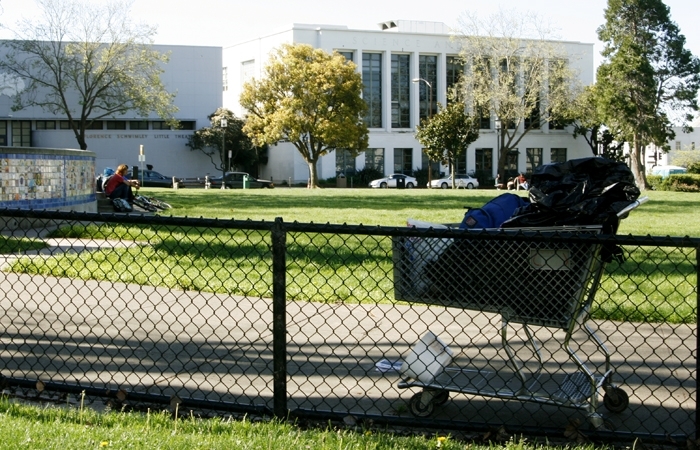 "But right now, Berkeley High has a problem."